Authorities say the unidentified gunman is a bearded white male in his 40s, wearing a red sweatshirt, according to Ms Washington's 15-year-old daughter, who got a glimpse of the man. He reportedly pulled up beside the family's car in a red pickup truck on Sunday morning and began firing with no provocation, Harris County Police said. "We will not rest until an arrest is made. We are going to continue to search for this killer," he said at a news conference. 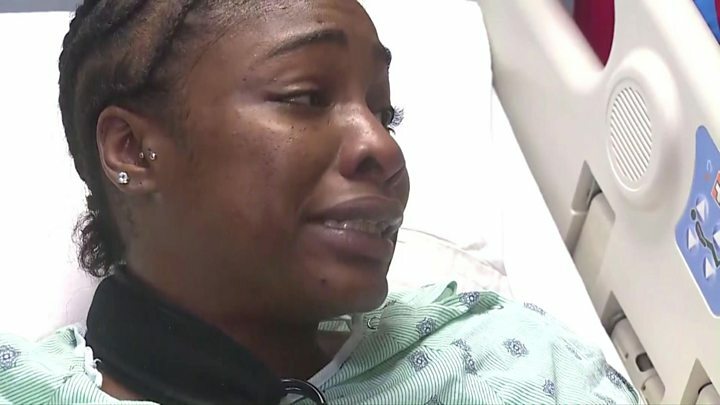 From her hospital bed, Ms Washington tearfully told KHOU 11 News: "I replayed this moment in my head over a million times to see - did I cut this man off? "Did I make a wrong turn in front of him?" "Did I do anything wrong to cause this man to fire shots at my car? I didn't. "I didn't do anything. He fired off at us for no reason." Police have urged anyone with information to come forward, asking locals to review security camera footage in their homes or businesses to help track down the gunman. How easy is it to buy a gun in Texas? Is gun control movement #NeverAgain too white? "Yes, we know we're in Texas. Yes, we know we have a lot of pickup trucks out there," Mr Gonzalez said during a news conference on Monday. "But when you put the pieces together, consider that we're looking for a bearded man, possibly in his 40s, driving a red pickup truck. This could be your neighbour. This could be your co-worker." Jazmine's father, Christopher Cevilla, told reporters his daughter was a "loving, caring" young girl. "What if that was your daughter?" he said. "Please step up at this point in time and help me and my family get justice for my baby girl." Ava DuVernay, director of films Selma and A Wrinkle in Time, was one of the many voices on social media calling for the gunman's capture, sharing the family's story in a tweet. Actresses Sophia Bush and Gabrielle Union have also both spoken out online. Some social media users are suggesting the attack was a hate crime, and Mr Gonzalez said police are "not tone-deaf" to community concerns that this was race-related. The sheriff said while authorities are "not ruling anything out", it would be "irresponsible" to claim race was a factor "without fully knowing that is the linkage". Civil rights attorney Lee Merritt and activist Shaun King have offered a $100,000 (£79,300) cash reward for anyone who can help capture the suspect. Local activists have planned a rally following Jazmine's funeral on Saturday. On Thursday, Houston Texans player DeAndre Hopkins tweeted that he would use his playoff earnings to help the family cover funeral costs, saying: "When I see Jazmine Barnes' face, I see my own daughter." Video How easy is it to buy a gun in Texas?